My mom always says that she can trace every failed diet back to a single M&M. And I’d have to say I’m with her. Anyone else? 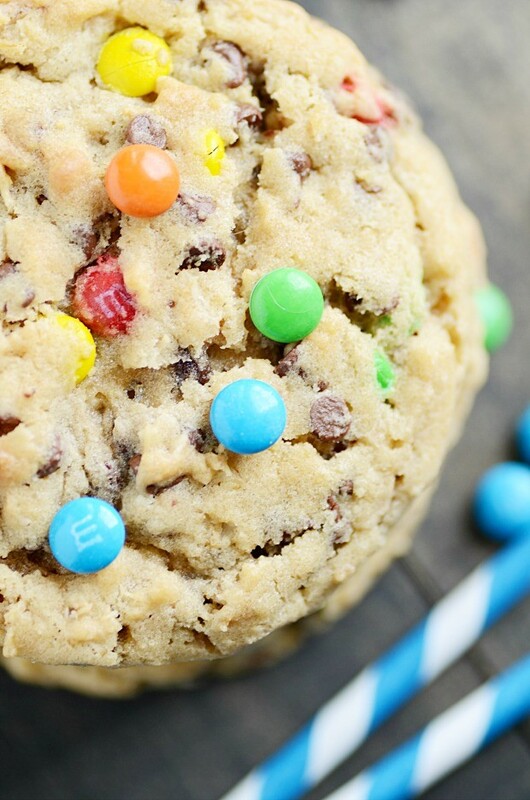 M&Ms are like the gateway drug that lead to all other paths of sweet (but skinny jeans-obliterating) indulgences. 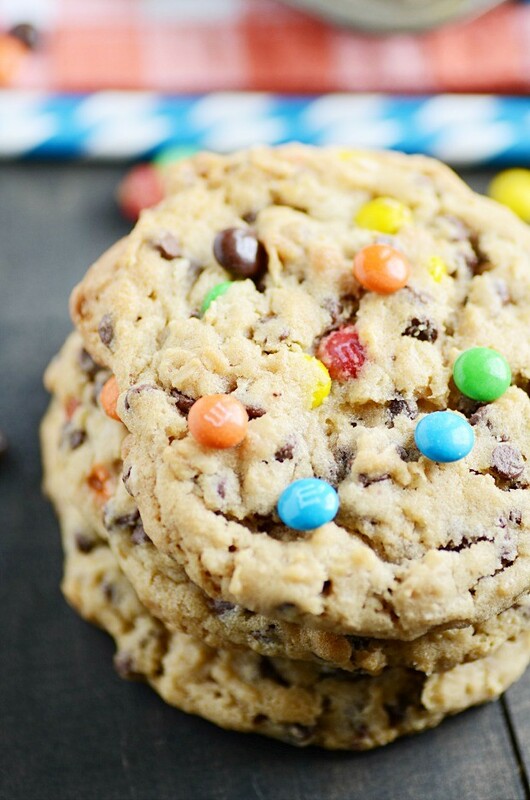 Like… M&M Oatmeal Cookies. I’d have to say that’s a pretty natural next step to take after M&Ms. A natural and classically delicious next step! These cookies are total comfort food. They’re hearty and chock full of buttery cookie goodness, and we could not get enough of them around here. In fact, they didn’t even make it to the office. We had these gobbled up at somewhere close to the 48-hour mark… maybe even less than that! This recipe is based on the King Arthur Flour Chocolate Chip Oatmeal Cookies I made a couple of months ago. So far, KAF has produced my two favorite chocolate chip cookie recipes in the Chocolate Chip Cookie Experiment, and this is one of them. They are super chewy and (dare I say it again? Ok, I dare…) hearty. 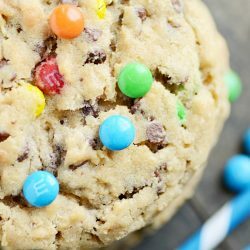 They’re just so super satisfying, and those M&Ms just put these cookies right over the top. Warning: don’t make these home alone! 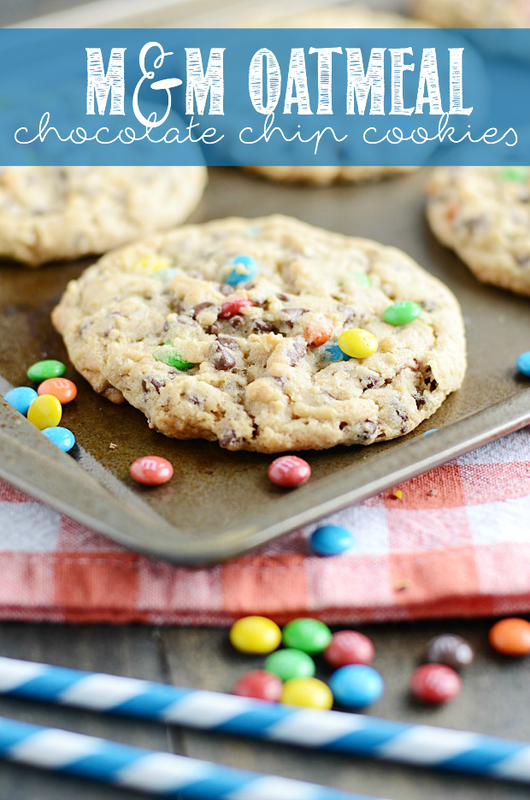 These cookies are wonderfully chewy with a great oatmeal texture and jam-packed with 3 cups of chocolate chips and M&Ms! Beat together the butter and sugar until smooth and creamy. 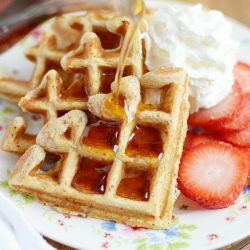 Mix in the egg, egg yolk, and vanilla, mixing well in between each addition. 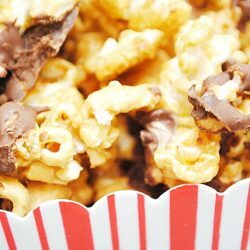 In a large bowl, mix together the flour, oats, baking powder, baking soda, and salt. Add this dry mixture to the wet mixture. Mix until dough forms. 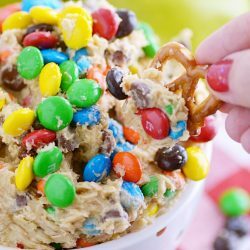 Mix in chocolate chips and M&Ms. Scoop the dough onto prepared baking sheets, leaving about 2 inches in between each for spreading. Bake for 12-15 minutes until edges are lightly golden. Let cool on the baking sheet before transferring to a wire rack.